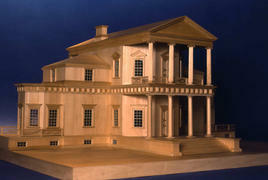 Though more modest in size than its successor, the first version of the Monticello house was hardly less ambitious. Built in a strict neoclassical style with double porticoes, it was a building that, as one European visitor wrote in 1782, "resembles none of the others seen in this country." This was the house that Jefferson was fashioning when he married Martha Wayles Skelton in 1772 and in which they planned to raise their children. During its construction Jefferson served as member of the Virginia House of Burgesses in Williamsburg, Virginia; as a delegate to the Second Continental Congress in Philadelphia, Pennsylvania; and as Governor of Virginia in Richmond, Virginia. This is same period in which he wrote the political documents that made his early reputation: A Summary View of the Rights of British America, the Declaration of Independence, and the Statute of Virginia for Religious Freedom, which was later enacted into law. The exact extent to which the house was finished is unclear. The physical and documentary evidence indicates that by the death of Jefferson's wife in 1782, the house had been enclosed. But twelve years later, after serving five years as the United States Minister to France and four as President Washington's Secretary of State, Jefferson wrote to a friend that he was "living in a brick-kiln," suggesting that much of interior work had not been started. Northeast wall of Parlor during 1953 renovation work.